10 February 2018, 6:01 p.m.
A wet Te Rapa had the connections of Start Wondering in a sombre pre-race mood, but New Zealand’s reigning champion sprinter didn’t let the rain dampen his parade. The Wanganui seven-year-old overcame the Slow 9 going on Saturday to successfully defend his title in the Gr.1 BCD Group Sprint (1400m). “Any Group One win is special, but we weren’t expecting it today,” said Evan Rayner, who trains the gelding with his daughter JJ at Wanganui. Fourth in the Gr.1 Railway at Ellerslie when caught in the slowest part of the course, Start Wondering settled in behind the pace before striding to the front 200m from home for regular jockey Johnathan Parkes. The gelding dug deep in the final stages to keep the challenge of Packing Eagle at bay with the longshot Brilliant Shine taking third money ahead of Ronchi. 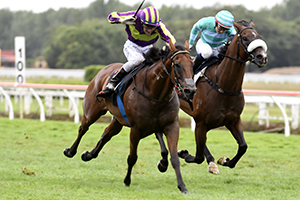 Last season, Start Wondering finished runner-up in the Gr.1 Haunui Farm WFA Classic (1600m) after his Te Rapa success and he is again likely to head to the Otaki feature. The disappointment of Saturday’s race was the warm favourite Kawi, who was gunning for the eighth Group One victory of his career. However, he was on the back foot early after he missed the start before he picked up ground 600m from home. The son of Savabeel was widest into the straight, but he was never a threat in the run home and finished sixth. – NZ Racing Desk.